ODESSA, Ukraine -- Ships from Georgia, Romania, Turkey, Ukraine and the U.S. departed the port of Odessa and the nearby Western Naval Base yesterday to participate in the free-play phase of Exercise Sea Breeze 2017. The guided missile cruiser USS Hue City departs Odessa, Ukraine, for the at-sea phase of Exercise Sea Breeze 2017, July 13, 2017. 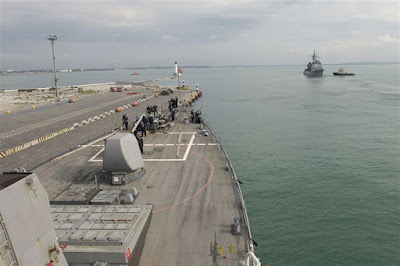 Sea Breeze is a U.S.-Ukraine co-hosted multinational maritime exercise held in the Black Sea and is designed to enhance interoperability of participating nations and strengthen maritime security within the region. Sea Breeze is a U.S. and Ukraine co-hosted multinational maritime exercise held in the Black Sea to enhance the interoperability of participating nations and strengthen maritime security in the region. The exercise is taking place from July 10-22, and air, land, sea, and amphibious forces from 17 nations will participate. While the first phase of the exercise consisted of knowledge-based scenario training, the second phase will focus on the ability of participating forces to react to various scenarios. The initial push was to integrate individual units into one organization, said Navy Capt. Matthew Lehman, deputy commander of U.S. 6th Fleet's Task Force 65 and the officer in tactical control of the exercise. "During the initial phase, the surface ships focused on command-and-control and platform interoperability to allow for better coordination during the more advanced underway phase," Lehman said. "They knew what to expect." The second phase, however, will be more complex, he added. As the exercise forces transition into free play, an exercise control cell will inject information about notional events as part of the scenario. Operational-level leaders will assess the events and order tactical units -- such as ships -- to respond with controllers evaluating the decision-making and the execution of tasks by the tactical units. "They know the mission and specified task, but they don't know the implied task," said Ukrainian navy Capt. Andrey Ryzhenko, commander of maritime forces for the exercise. More than 30 ships will participate in the four-day free-play phase, operating and training together in the Black Sea. Divers will conduct search-and-rescue and explosive ordnance disposal missions, while other units will carry out anti-submarine warfare, submarine warfare and air warfare missions. According to Lehman, aviation and amphibious components will also be tested during this phase. U.S. Marines will operate with their Ukrainian and Turkish counterparts, carrying out visiting, boarding, and search-and-seizure missions at sea and employing other tactics on land. "The key thing about this exercise is, over the last renditions of it, it's becoming far more complex; a very robust sea, air and land component," Lehman said.